Mille Bornes (; French for a thousand milestones, referring to the stone distance markers on many French roads) is a French card game. Mille Bornes is listed in the GAMES Magazine Hall of Fame. The game was created in 1954 by Edmond Dujardin, and was quite similar to the earlier American automotive card game Touring. A key innovation was the addition of the coup-fourré, whereby bonus points are earned by holding back a safety card (such as the puncture-proof tire) until an opponent plays the corresponding hazard card (in this case, the flat tire). Some Mille Bornes decks are printed in both English and French. The Spanish version Mil Hitos, distributed by Heraclio Fournier, was very popular in Spain during the 1970s. In the Netherlands there is a variant of this game, Stap op, which deals with cycling instead of driving. The hazards and distances are different, but the mechanics of the game are exactly the same. The premise of Mille Bornes is that the players are in a road race. Each race - or hand - is usually 700 miles (or kilometers) long, but the first player to complete that distance exactly has the option to declare an extension in which case the race becomes 1,000 miles. Other times the game is played up to 1000 miles first, and then the first player to complete that distance has the option to declare an "extension" for 1,200 miles. Mille Bornes is played with a special deck of cards. There are hazard, remedy, safety, and distance cards. Each hazard is corrected by a corresponding remedy, and is actually prevented from happening in the first place by a corresponding safety. The target distance is reached by playing distance cards. Also included in the deck are nonplayable cards that list the playable cards and summarize the scoring. In some decks, some of these are printed entirely in French. Typical Mille Bornes Tableau. The player has traveled 725 km, has a Roll and a Speed Limit in effect, and has played the Driving Ace and Extra Tank safeties, the latter as a coup-fourré. The deck is shuffled and six cards are dealt to each player; the remainder becomes a draw pile and a discard pile forms next to it. Each player's turn begins with a draw of one card and a play of one card, so that each player always holds 6 cards at the end of his turn. If a player cannot play that player must discard (any card in hand). Discarded cards are dead and cannot be taken for any reason. Each player (or team) builds a tableau. The tableau is divided into battle, speed, distance, and safety areas; cards in the battle and speed areas are stacked so that only the top card shows. The example shows a typical tableau midway through a game. Hazards and remedies (with the exception of Speed Limit and End of Limit) are played in the battle area, where a Roll card is shown in the example. 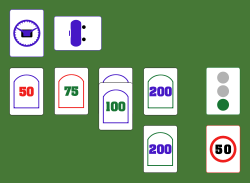 Speed Limit and End of Limit cards are played separately in the speed area. Distance cards are played according to value; it is common to play the 200-mile cards distinctly, rather than fanned. Safety cards are played along the top of the tableau; note that the horizontal placement of the Extra Tank card in the example has a special significance. A distance card on his own tableau if a Roll card is showing in his battle area. A remedy on top of the corresponding hazard if one is showing in his battle area. An End of Limit on top of a Speed Limit if one is showing in his speed area. An Accident, Out of Gas, Flat Tire, or Stop hazard in his opponent's battle area if it is not empty. A Speed Limit hazard in his opponent's speed area if it is empty or showing an End of Limit. This is the only hazard that can be played against an opponent who has not yet played a Roll card in his own battle area. A safety in his own safety area (at any time). A Roll card in his own battle area if a Stop or remedy is showing, or if his battle area is empty. Once an Accident, Out of Gas, or Flat Tire hazard has been played, and the appropriate remedy card played as a counter, the player must next play a Roll card in order to get moving again. A hazard can be played onto an opponent's battle area even if another one is already showing, but only the topmost hazard needs to be corrected before that player can use a Roll card. Playing a Roll against a Stop hazard corrects it and allows the player to start moving; a second Roll is not needed. Playing a safety corrects the corresponding hazard and also protects against future hazards of this type. However, when the safety is played normally, a Roll must still be played before any distance cards. Whenever the safety is played, the same player draws another card immediately and plays again. It is possible to play consecutive safeties on one turn, each time drawing a card before playing again. A player whose speed is limited (as shown in the example) may only play 25 and 50 km cards. No more than two 200 km cards may be played by any player or team in a single hand. Whenever a hazard is played, any player holding the corresponding safety may immediately play it and declare a coup-fourré. This may be done whether or not the player holding the safety was the one attacked by the hazard. The safety is laid down horizontally in the safety area, and the player draws a new card and takes his/her normal turn, skipping all players between the attacker and him/herself. In addition, if he/she was attacked with the hazard, it is moved to the discard pile. The Right of Way card both remedies and protects against Stop and Speed Limit hazards. If a player uses this safety, he/she need not play a Roll card in order to get moving again; any Stop or Speed Limit cards showing in the battle/speed areas are moved to the discard pile. However, the player is still vulnerable to other hazards. If an uncorrected hazard is revealed in the battle area due to the Right of Way or a coup-fourré being played, and the corresponding safety is not in effect, the hazard must be corrected (and a Roll played, if necessary) in order to start moving again. Players may always discard, even if they have a legal play available. A player who cannot play in any other way must discard. Under no circumstances may a distance card be played that would put the player's total over the race goal of 700 or 1000 km. all players have played or discarded all their cards. Note that play continues after the draw pile is exhausted, each player playing or discarding one card per turn. Once both players run out of cards in their hand with a depleted draw pile, play ends. In a 2-player game, the maximum score that can be made in one hand is 4,600 points. In a standard 4-player game there is no extension, so the maximum score is 4,400. In a 3-player or 6-player game, two shutout bonuses are achievable, yielding a perfect score of 5,100. Note that some points are scored even if a side does not complete a trip; it is possible for the completing side to score fewer points than their opponents. If the hand ends by exhaustion rather than by completion, each side still scores its distance and safety points. According to the printed rules distributed by Parker Brothers, a game continues until one or both sides reaches a cumulative point total of 5,000. If both sides go over 5,000 during the same hand, the higher point total wins the game. When the game is played for fun the exact point total is irrelevant, so long as one is higher. Note that it is possible for the game to end in a tie, in which case the rules are silent. If the game is played for money, then generally the point difference is paid from the loser to the winner, and every point is significant. 2, 3, 4 or 6 Player play is possible with slight rule modifications and where in the case of the 4 or 6 player versions, players team up into teams of two each. For detailed play see Wikibooks article.